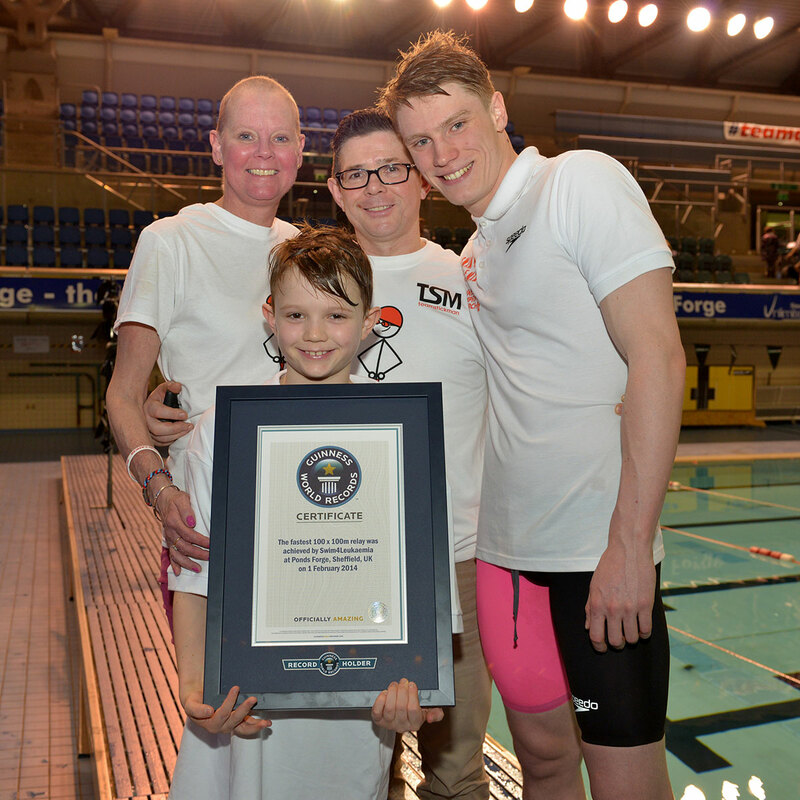 Today marks five years since British swimmer Lewis Coleman and 99 friends and family successfully set a Guinness World Record in the 100×100 relay. As part of our 150 year anniversary celebrations, we take a look back at the day. A team of 100 swimmers featuring British internationals past and present have set a Guinness World Record over 100x100m at Ponds Forge, Sheffield to raise money for cancer research. Olympic medallists Rebecca Adlington, Steve Parry and Michael Jamieson were among the 100 who took to the water in front of a full house in Sheffield as the team set a new record of 1 hour 29 minutes and 3 seconds, to smash the old time of 1 hour 37 minutes and 53 seconds set in Australia in 2011. “It was an absolutely fantastic day,” said Coleman. “I’d like to thank everyone for coming down and helping us to raise over £26,000 for Leukaemia and Lymphoma Research [now known as Bloodwise]. Everyone’s support has been overwhelming. “I just wanted to be part of it and help Lewis,” added Adlington. “His family are going through such a lot and it’s a brilliant charity so I’m really pleased we were able to break the Guinness World Record. Edinburgh University swimmer, Caitlin McClatchey, said: “Lewis has done an amazing job, he is an absolute inspiration. The record breaking team was made up of past and current GB international swimmers, Olympians and National standard club swimmers. In particular, swimmers from the City of Sheffield Swim Squad and other clubs around the country. Before the World Record attempt, Lewis organised a series of swim clinics. These were led by Olympic and Paralympic Coach Russ Barber and supported by Olympic, Paralympic, World, European and Commonwealth Medallists and GB International swimmers.